Sherlock fans know that there are hundreds of interpretations of the Baker Street sleuth to enjoy while they count down the days to Series Four and enjoy Doctor Strange set photos. One that Sherlockians should definitely check out is another series of films that updated the Great Detective to the (then) modern day. Here are five reasons why the Basil Rathbone/Nigel Bruce films are worth a look if you haven’t yet seen them—or even if you have! Firstly, Basil Rathbone closely matches Conan Doyle’s physical and emotional descriptions of Sherlock Holmes—dark, cerebral, analytical, brusque, and relentless. 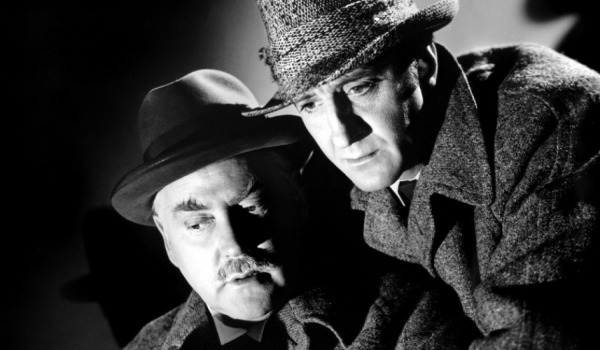 If you don’t believe us that Rathbone had acting chops, he was twice nominated for an Academy Award (though unfortunately not for his portrayal of Holmes), and lost both times to the same actor—Walter Brennan. Thankfully, Rathbone’s talent is commemorated with three stars on the Hollywood Walk of Fame: for film, radio and television. On the other hand, Holmes’s partner in (solving crime) Dr. Watson was here sketched with the bumbling, stereotypical portrayal we have sometimes seen on the large and small screens. Despite the unflattering and frankly inaccurate characterization, though, Nigel Bruce provides an eminently watchable and sympathetic Watson. There are numerous Holmes readings that put a new twist on the Conan Doyle canon. During World War II, England’s most iconic hero was called into service to inspire a nation at war toward victory. In films such as Sherlock Holmes and the Secret Weapon and Sherlock Holmes in Washington, Holmes and Watson fought for freedom against oppressive and genocidal forces, vanquishing Moriarty and the Nazis and uplifting audiences during a dark time. Much like Jeremy Brett, Rathbone’s regal features, resonant voice and elegant bearing made him perfectly suited to playing Sherlock Holmes, which he did in the fourteen films with Bruce and a staggering 200 radio plays. Ironically, though he was initially overjoyed to be cast as the hero instead of the villains he usually played, Rathbone became so tired of playing Holmes, that, according to his IMDB profile, he returned to Broadway. However, the lure of Baker Street (and perhaps a steady paycheck) soon drew him back. Before donning the deerstalker, Basil Rathbone was well known as a Shakespearean stage actor. He also had prominent roles as suave villains in thrilling epics such as The Adventures of Robin Hood and Captain Blood, in which he was able to showcase his fencing prowess. Rathbone was considered among the best swordsmen in Hollywood and filmed one of the most exciting duels in film history at the age of 63 in The Court Jester, opposite Danny Kaye. Rathbone used his athleticism to great effect in the Holmes films. 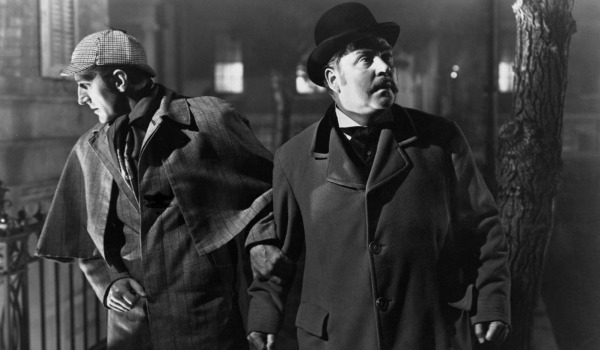 Rathbone’s first Holmes outing was The Hound of the Baskervilles, the best-known of Conan Doyle’s stories, and the fog-shrouded mystery provided an entertaining entrée to the Baker Street duo. After this, however, the films took a rather Sherlock-like approach to the canon, picking and mixing elements from Conan Doyle’s novels to create a new story. 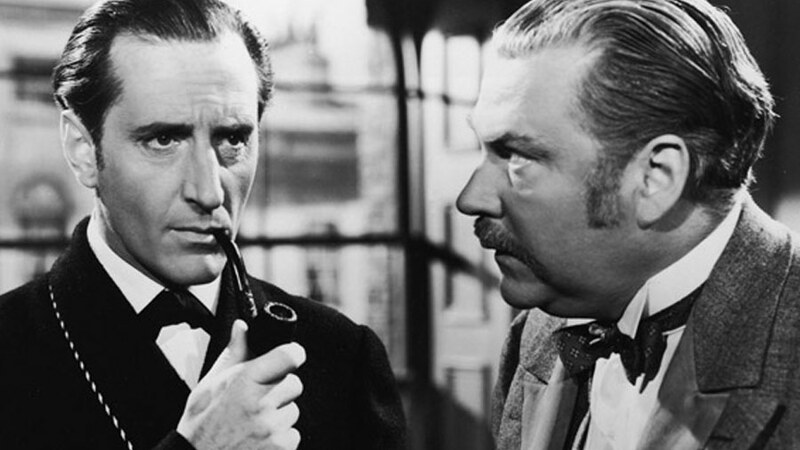 Whatever the mystery, you can be sure that Rathbone’s skilled, vigorous Holmes and his loyal friend Dr. Watson will solve it. Are you tempted to check out the Rathbone films? If you have already, which is your favourite? Tell us in the comments! The 1939 Hound is my favourite, because it’s so faithful to the original. Other excellent ones are Sherlock Holmes Faces Death and The Scarlet Claw, but every film is very watchable. It’s worth remembering that the creators of “Sherlock” were inspired by their affection for the Rathbone/Bruce movies, and how they had made him relevant to a modern generation.